That’s all you need, honestly. It may not seem like much, but the effects are startling. 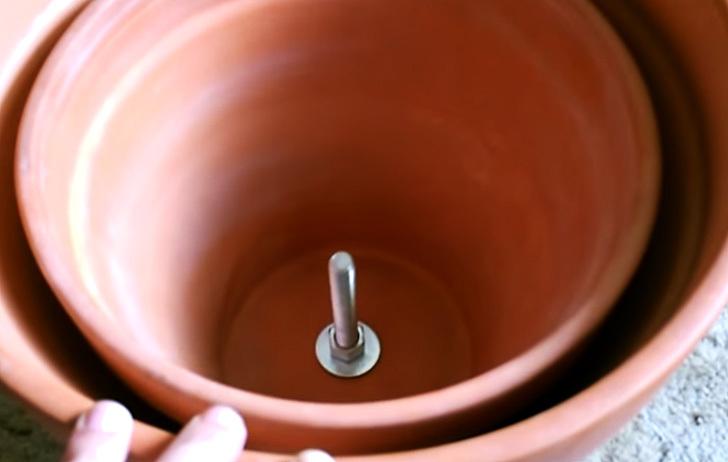 Slide the bolt through the larger pot, securing it into place with the washer and hex nut. Place another washer on the other side of the nut and slide the other pot inside, securing that one (tightly!) onto the bolt with another nut. There should be at least a 1/4-inch gap between the two pots. 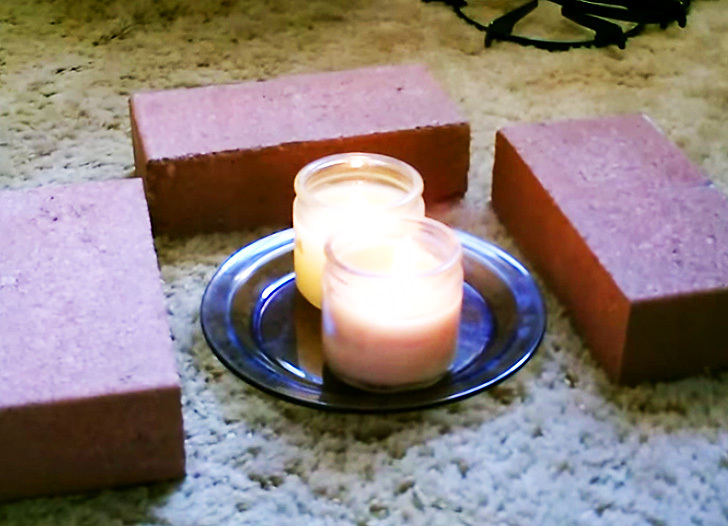 Light the candles and place them on the plate, and arrange a few bricks around that so the pots will be elevated from the ground. Place the doubled-up clay pots over the candles, and leave it alone. This little oven heater will reach about 160F within 20 minutes or so, and after 30-40 minutes, it’ll be too hot to touch. You can imagine how much radiant heat these let out! They create more than enough warmth to heat a room, or a very small studio apartment, and won’t add a single cent to your electricity bill. You could even use them to reheat your drink–just set your mug on top of the heater for a minute and it’ll warm up nicely. These heaters are great to have on hand for emergency situations (like mid-winter power outages), and all the supplies needed to put them together can be kept together in a storage bin for just such occasions. One thing to keep in mind: if you have pet birds, it’s better to use soy or beeswax candles, as paraffin smoke can cause severe respiratory damage in birds. All pets and small children should be kept well away from the heaters as they can get really hot to the touch, so take precautions and be careful. 1. Candles are not a good source of heat 2. Sure, the pots add thermal mass, which will radiate what little heat they've absorbed out over time. 3. Combust in an enclosed space? Hello, carbon monoxide. The worst thing ever placed on inhabitat. As others have noted two candles won't generate enough heat to warm your house. These things have been disproven many times. Please research. But what puts this over the top is the photos of lighting candles on a carpet. Did anyone on the editorial team read or look at this before posting? What's happening here inhabitat? Better have good ventilation or get sick breathing the burning candle fumes. I can see several of these heating a small but the question is for how long will they heat it? I guess it depends on how big the candles are but I cannot imagine the last for more than a few hours. They would be good in a pinch should the power go out to other than that these are just a novelty even for do-it-yourselfers. They work to remove the chill even without the bolt inside. The smell of candles is a bit much but they definitely do work, in a pinch. This is nonsense. Candles produce about 60 watts of power. Two of them won't heat a room any more than a pair of incandescent lightbulbs would, regardless of what kind of container you put them in. Sorry but I must invoke the laws of thermodynamic here. Yes candle wax is a fuel and burning the fuel will create heat that will be released into the room. Putting a pot over a heat source will not change the amount of heat released by the heat source. Adding the pot will not increase the temperature of the room. My greatest fear during winter is losing electricity and, until now, there has been no workable solution. This post could be a life-saver. 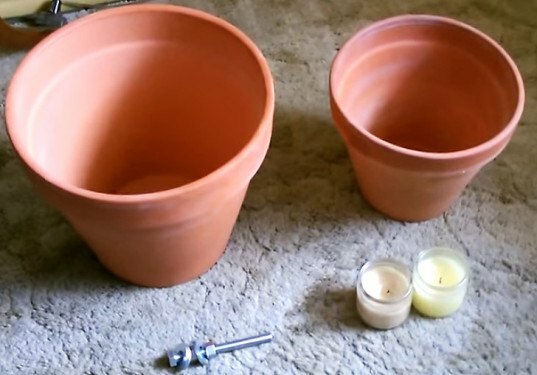 For an old woman who is not a DIYer, would you please give exact measurements for the two pots and candles? Also, what would you recommend to put down over the carpet as a base to protect it from the heat? Is there anything else I need to know for safety's sake? Many thanks such for such a simple solution to a worrisome problem. Not a great idea to show it sitting on a carpet. Very unsafe set up. 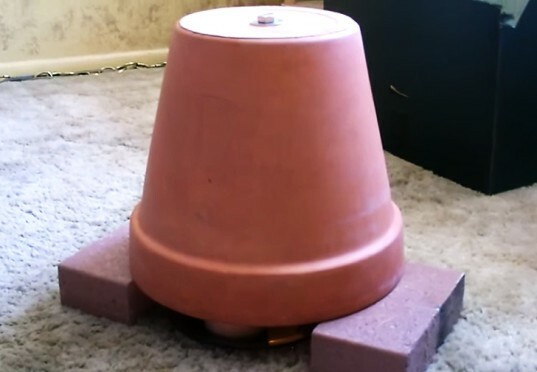 How to build your own clay heater.